Why On Earth Is President Obama Going All-In On Tom Perriello? : It's All Politics The president is rallying Virginia Democrats not by going to a safe precinct but by going to the least safe. And by appearing with Rep. Perriello, he may be saluting the past -- their victories in 2008 -- more than the likelihood of victory in 2010. Why On Earth Is President Obama Going All-In On Tom Perriello? We're down to the last days of the campaign, so wherever President Obama goes is going to be read as a metaphor. That's why people are scratching their heads about the first stop on the president's last itinerary on behalf of his congressional majorities. The 5th District of Virginia, home of freshman Democrat Tom Perriello, has been on every list of the endangered, usually near the top, since the campaign began. So why does the president want to head into the final weekend smiling and waving by the side of a guy most people expect will lose? Is he sending some kind of a signal? Well, yes, a rather mixed signal. And like a lot of the messages that come from this president, it may be lost on many. But let's try to unbraid it for a moment and see what we've got. Perriello is probably a goner for one simple reason: Of all the push-the-limits districts Democrats annexed two years ago, his was the farthest frontier. It took six weeks and a recount for Perriello to be declared the winner over 12-year incumbent Virgil Goode by a mere 727 votes (the narrowest margin by percentage in any district nationwide). From NPR's Election Scorecard, where Political Editor Ken Rudin says the race "leans Republican": "Perriello knew he was targeted for defeat from Day One, but he nonetheless voted for the health care bill. Robert Hurt, a state senator, has his own problems; he voted for a tax increase in 2004 in the state Legislature. One thing that has the potential of hurting Hurt's chances is the presence on the ballot of Jeff Clark, a conservative independent." While electing Perriello, the district also preferred Republican presidential nominee John McCain over Democrat Barack Obama by three percentage points. The only surprising thing there is that McCain did not win by more. Four years earlier, President George W. Bush carried the district by 13 percentage points. The 5th is a pyramid expanding from just north of Charlottesville at its peak to the Carolina line at its base. It is still called "Southside" in Virginia, remembered as the home of Appomattox Court House where Lee surrendered to Grant and where many officials refused to comply with Brown v. Board of Education, the Supreme Court's school desegregation order nearly a century later. For generations the district voted for Dixiecrats like Dan Daniel, who embodied the Old South. Goode, a somewhat updated version of Daniel, won the seat in 1996 and later switched to the GOP before losing by an eyelash to Perriello. The difference in 2008 was a big turnout in college towns such as Charlottesville and among the district's African-Americans, who are not quite one-quarter of the population. Perriello rode that surge with a tough, well-financed campaign of his own, adding just enough to win. This year, no one expects that 2008 surge to be anywhere near as potent. It certainly wasn't one year ago, when the 5th went decisively for Republican candidates for governor and other statewide offices. 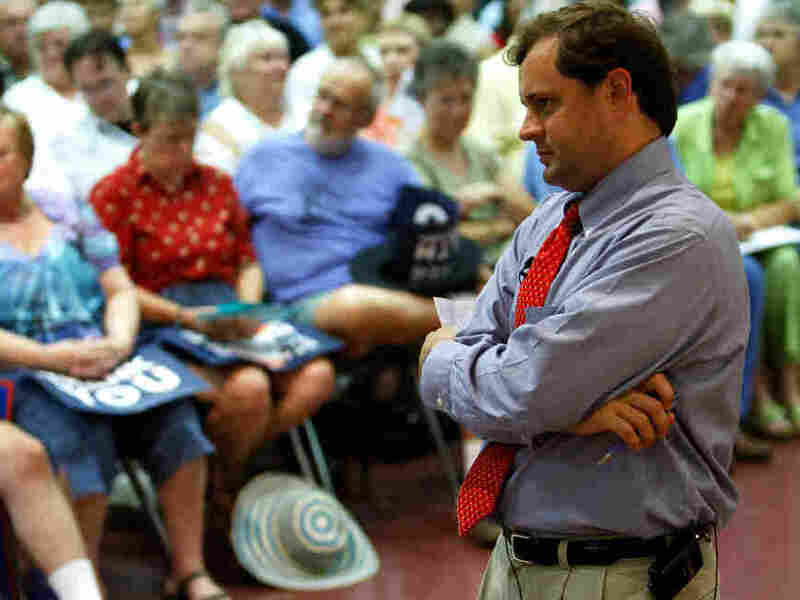 Perriello has worked hard to win over his largely rural, deeply traditional constituents. The native son of the district with two degrees from Yale who founded two faith-based non-profit groups has been a model congressman. He has the endorsement of the National Rifle Association and can say he reached out to Tea Party activists during the campaign. He voted against the first Obama budget in 2009, as well as for a delay in the payment of funds in the bank bailout. But when the big ones went down -- the stimulus, health care, the energy bill known as "cap and trade" -- Perriello was there for his party and his president. And with those votes he may have stamped himself more as Obama's man than as a Blue Dog. Seven Republicans lined up in the primary for a chance to oppose Perriello in the fall. The one who survived to challenge Perriello next Tuesday was state Sen. Robert Hurt. When you look over the rest of the president's final swing, it all makes political sense. The main focus is on the key states of the Great Lakes region where the Democrats are hurting badly -- Pennsylvania, Ohio and Illinois. The Democrats could lose three races for governor and three more for the Senate in these states, along with as many as 10 House seats. But most of those contests are still close, and the president hopes to make a difference. But can he make a difference in Virginia? Is this the best district in the state for him to pop up in right now? And if the Obama program is what made Perriello vulnerable, is this the camera-magnet this freshman wants to be with right now? Clearly, the White House and the Perriello camp think the answer is yes across the board. They may think the race can still be won with some version of the 2008 formula, and indeed some recent polls have made it much more competitive than it was over the summer. Be that as it may, there is something to be said for the ambition of the gesture. The president is rallying Virginia Democrats not by going to a safe precinct but by going to the least safe. He is saying thanks not just to Perriello but to all the people who were part of the Obama breakthrough in the state in both the primary and general elections of 2008 (the first time Virginia voted Democratic in 44 years). And by extension, this is a gesture to others who were part of the movement in other states, as well. No one knows better than the president and this one freshman congressman that the political landscape has shifted since they won -- and that it continues to change. The politics of 2012 may well be something different again. In other words, standing together once more before this midterm may not really be about what is happening right now. It may constitute a salute to what has happened and what may happen again.